Strawberry Jam is the first complete collection that I designed. It was a little slow to start, but once I had the first pattern finished - I knew exactly what else I wanted. The collection is named after my grandmother. 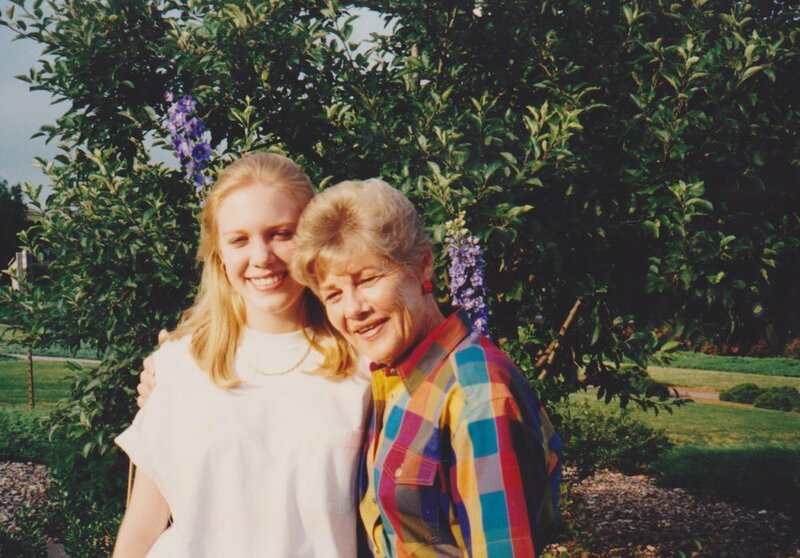 As a toddler, I tried to say “grandma,” but it came out “Jama.” The nickname stuck and it always felt special to me that I never knew of any other grandmas that went by Jama. As I got older, I shortened Jama to just Jam. She always seemed so glamorous to me, which probably would have tickled her to no end. 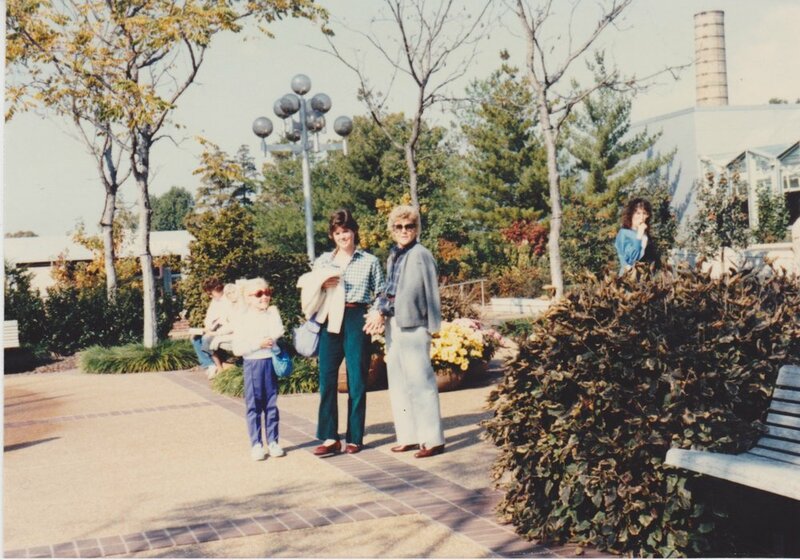 From left to right: me, age 5 or 6, my mom and my Jam at the botanical gardens in St. Louis. I have so many happy memories of the time I spent with her, but there are two that always make me smile. Sometimes she would let me take my bath in her giant bathtub and she would let me play with her antique lady bells that were carefully arranged on the back of the tub. After my bath she would let me use her fancy talcum powder with a big fluffy powder puff. During a summer visit before I started 7th grade, we went out for chocolate malts and patty melts at an old fashioned soda fountain every day for probably two weeks. We would go out for our daily chocolate malt and then head to the movies or the craft store. When I got home, none of my clothes fit, but I had had the best time with her. Me and my Jam in her garden - both squinting into the sun. My Jam’s house was always so beautifully decorated. It was very traditional and she filled it with beautiful things from her travels. Her house was filled with beautiful patterns - a green floral wallpaper with matching drapes and bed linens - a beautiful toile drape in the living room. While I designed this collection I found my mind drifting to my Jam often, and as more and more patterns came out - I realized that they made me think of the summers that I spent with her. Strawberry Jam is a celebration of all of these memories. Over the next few days I am going to give a few sneak peeks into the collection over on my Instagram page. Below are a few patterns from the collection. Strawberry Jam contains ten total patterns in two separate color ways. Below I’ve previewed just four - (from left to right) called Happy Blooms, Happy Meadows, Strawberry Fields and Strawberry Lattice. If you haven’t yet signed up for my newsletter - make sure to do so today. The very first newsletter ever will be heading out on November 1st, so you don’t want to miss out. I have designed two printables and two downloadable wallpapers. They are exclusive to my monthly newsletter subscribers.